This activity is perfect when you want to have your students practice measuring objects with either non-standard units of measure (inch worms) or standard units of measurement (paper ruler is included in activity). Lesson plan has been differentiated to include one set of cards that focuses on one attribute of measuring-length, width, or height and another set of cards that has two attributes on one picture-measuring height and length. 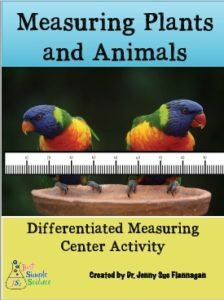 Perfect lesson to use when you are teaching about animals to embed the use of measurement within content.